Online registration is now open for the third annual Vermont 10 Miler on Sunday, November 3, 2019! This road race in Stowe, Vermont features 10 gorgeous road and bike path-miles through some of the Green Mountain State’s most stunning scenery. The race starts at 10:00 AM. Register early to save and secure your spot as this race is capped at 1,800 participants. A portion of each registration fee will be donated directly to the Stowe Land Trust, preserving Stowe’s most beautiful open spaces and promoting conservationism. Registered participants will receive a race bib and timing chip at registration which will be held November 2nd and 3rd. All participants must present a photo ID to pick-up their bib. Participants may pick-up for friends and family, but must provide a copy of the ID or a photo of the ID on their phone for verification – we will be diligently checking ID’s to ensure no runners bibs are handed out without their permission. It is recommended that all participants attend Saturday registration to alleviate race morning delays. All registered participants will receive a long sleeve cotton t-shirt with Vermont 10 Miler artwork on the chest, sleeve and back. All finisher’s will receive the finisher’s medal pictured. Please note that shirts are ordered weeks in advance of the event and that size quantities are based on what participants indicated when they registered. For this reason, we ask that you please pick-up the shirt size you registered for. 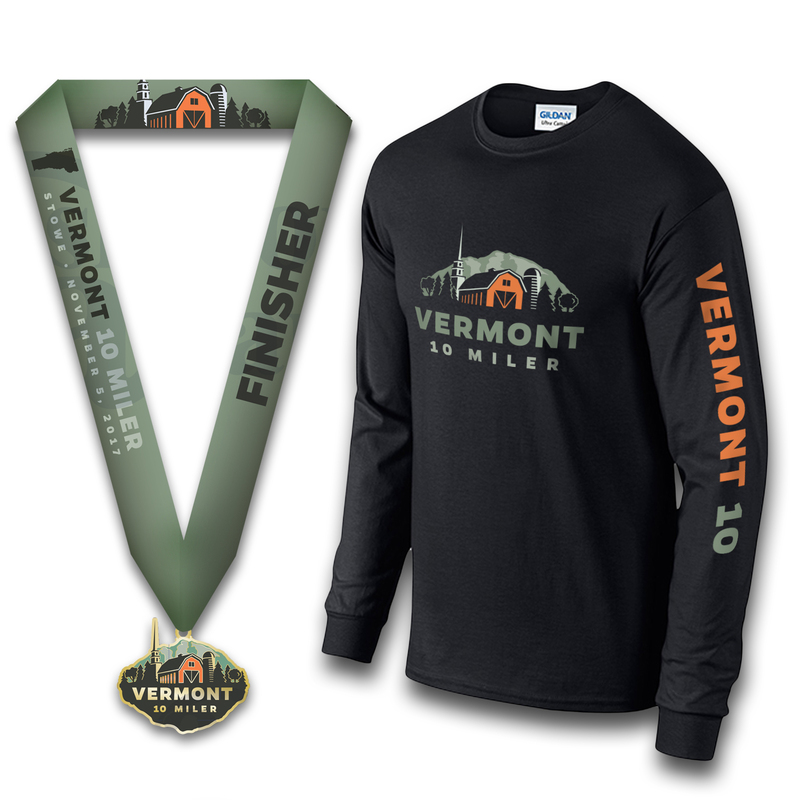 All registered participants will receive a long sleeve tech t-shirt with Vermont 10 Miler artwork on the chest, sleeve and back. All finisher’s will receive the finisher’s medal pictured. 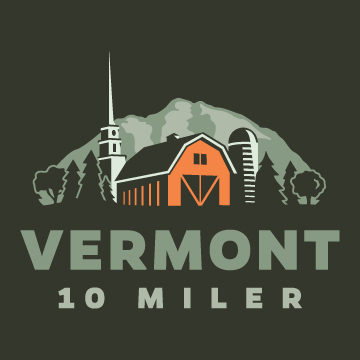 Vermont 10 Miler parking is available at the Mayo Farm/Stowe Event Fields (map), and is a short walk to both the start and finish of the race. Parking is limited in that there is only one entrance, and one exit. While our parking staff will be on site to assist, delays can build up. Consider carpooling or, if you’re staying nearby, consider taking the gorgeous Stowe Recreation path to the start on foot or bike! To ensure you have the most stress-free parking possible, please arrive early. 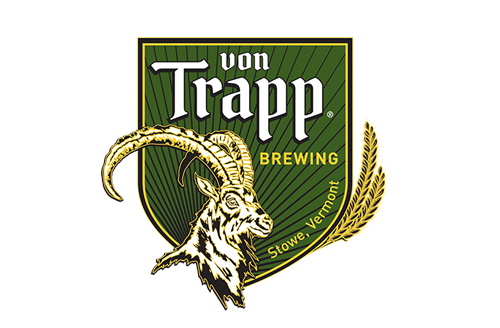 After you finish, grab a snack from our complimentary athlete food area and then hang out at our post-race beer garden — the first beer from Von Trapp Brewing is on us if you’re 21+ — and enjoy cheering on your fellow finishers! 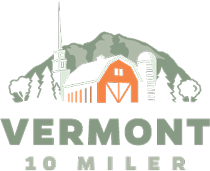 The Vermont 10 Miler has partnered with GoStowe to offer exclusive lodging discounts of up to 30%. For more information, click here. We do not allow strollers or pets in the race. Sorry! The Vermont 10 Miler course is in the heart of the Green Mountains. With a total elevation gain of 700 feet, runners and walkers should be prepared for some challenging hills on the first half of the course before a downhill and flat second half to the course. Our free bag drop will be available to all runners starting at 8:30 AM on race morning, near the start/finish area. You must provide your own bag — we will be using adhesive tape to identify bags based on runners’ bib numbers. Note: Parking is near the race start/finish — runners are encouraged to return their gear to their car. Our gear drop volunteers are not responsible for any valuables lost in the free gear bag check. If you have valuable items, please leave them in your car or keep them on your person. There is always the potential for extreme or severe weather conditions. Race organizers will do as much as we can to ensure the experience is as safe as possible. In the event of severe weather like snow or thunderstorms, the race may be delayed as race officials consult public safety officers. If there is more than a short delay, if conditions persist, or the forecast calls for extreme weather, race officials reserve the right to alter or cancel the race. Entry fees are non-refundable. Please check the website, our Facebook page and your email before the race for any changes or cancellations. Also be sure to visit the Brewery on Saturday before the race to pick up your race bib and have a pre-race beer! Earn extra bling (and bragging rights) by joining us for the New England 10 Miler Series! Runners who complete all three races will receive an exclusive New England 10 Miler Series Medal and shirt, as well as recognition upon completion. 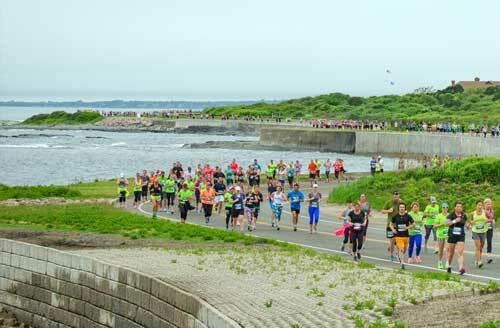 The 2019 series consists of three events, starting in Portland, Maine on April 28th, then Newport, Rhode Island on June 2nd, and finally Stowe, Vermont on November 3rd. This circular countryside course offers ten-miles of Vermont’s most beautiful roads and offers some great late Autumn vistas. 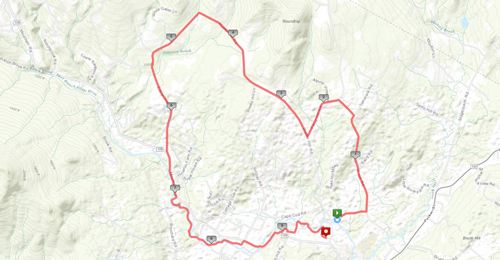 The course starts and finishes at Mayo Farm, with the first seven miles on local roads before turning onto the Stowe Bike Path for the final 3 miles of pedestrian-only traffic, crossing the West Branch River and finally returning to Mayo Farm. Join our mailing list below to stay up to date on all Vermont 10 Miler promotions and the most current race information.